Smile 4G Network which happens to be the first telecommunication service provider to introduce 4G LTE in Nigeria has existed since the year 2013 in Nigeria and West Africa. 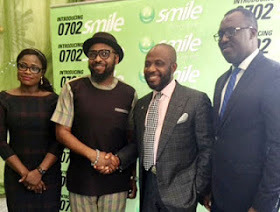 In order to expand their reach to so many people in Nigeria, they went further in introducing and launching their 0702smile 4GLTE sim pack. They went further in making known to the public their all-encompassing super value starter pack which entails you getting some good offers once you comply to their standard. Now, the super value startesecond goes for N1,000 and it offers users 30 days unlimited access to social network sites, 30 days access to unlimited free browsing, 30 minutes Short Message Service [SMS] and 30 minutes calls to any network of your choice. √ Check Out The 4G LTE Band Your Internet Service Provider Supports. √ Glo 4G LTE Data Plans And How To Subscribe. => Having been subscribed to Smile bundle plan, you are entitled to make local and international calls, send SMS, stream videos and musics, and browse the internet. => Smile looking forward to put smile on their customer's face decided to offer lowest call tariff that enables customers/users to make calls within and outside the country, to any network at just a call rate of 8kobo per second when using SmileVoice App on any Android smartphone, and its 4G LTE SIM on voice over LTE compatible phone. Also bringing to your notice because you ought to know, that Smile 0702 4G LTE sim would work on any 4G phones that supports band 20 (800Mhz) as it stands. Check Out Supported Mobile Phones For 4G LTE Network.